In 2014, the PLO issued a memo to journalists “advising” them not to use the term “Temple Mount” when referring to the area within Jerusalem’s Old City which houses Judaism’s holiest site and the third holiest site in Islam. Instead, they instructed reporters to refer to the site as the “Al-Aqsa Mosque Compound”, and even bizarrely suggested that using the term “Temple Mount” is a violation of international law. Though many journalists reporting from the area now note both names (Temple Mount and Al-Aqsa Mosque Compound), Financial Times’ Jerusalem correspondent did the PLO one better. In a 2000 word article about Jerusalem’s Old City (Jerusalem: City of Ruins, Oct. 1), he not only referred to the compound as Haram al-Sharif (the Arabic term), but didn’t once note that the Temple Mount (Har Habayit in Hebrew) is located in the holy city. The Temple Mount is the site where both Jewish Temples stood, and represents nothing less than the epicenter of the Jewish faith. As CAMERA noted in a backgrounder last year, “Jewish reverence for the Temple Mount long predates the building of the Dome of the Rock and Al Aqsa Mosque in the 7th century CE, and even predates the construction of the first Jewish Temple in 954 BCE”. 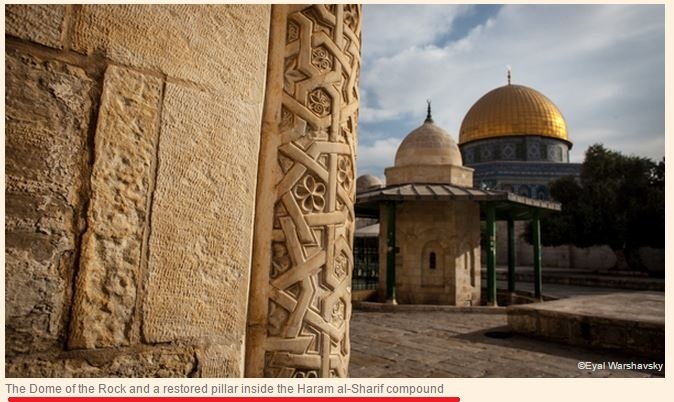 In addition to the omission in the text, graphics and photos used by FT editors also erase the existence of Judaism’s holiest site. Note that the caption in this photo fails to mention the Temple Mount. 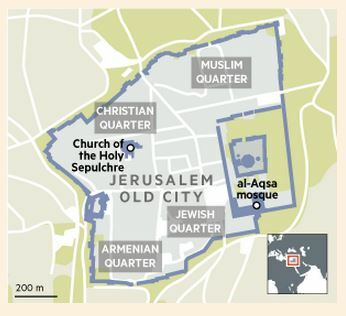 Now, take a look at this FT graphic map of the area which similarly omits the Temple Mount. However, even that passage is “balanced” by citing Palestinian claims that such Israeli archeology is used as a “political tool”. Of course, denying the Jewish connection to Jerusalem is par for the course for the Palestinians. However, professional journalists who omit such an important component of the Jews’ connection to the holy city are not only commiting a serious distortion of history, but are arguably engaging in a breach of the accuracy clause of the Editors’ Code. It is also important to stress that this is also erasing ** Christian** history and sacred territory, since Christians believe that Jesus of Nazareth **repeatedly*** came to the Temple on the required pilgrimages, with his parents, and supposedly had discussions with rabbis there as a boy, as well as supposedly chasing out the money changers as an adult (something that he is most unlikely to have been able to do in reality, since there is no way he would have been left to get on with wrecking the money changers’ stalls by the security guards of those days and the crowds of Jewish worshippers who used the money changers to exchange Roman coins with images of their Emperor for shekels suitable for making donations to the Temple). And Jesus referred to the Temple as “my Father’s house” and quoted the Torah quotation of the Almighty referring to the Temple that would be built as “my house”– so it was sacred to him too. This is never mentioned by UK and other western sources, and they need to be regularly reminded of it. When Joseph and Mary had done everything required by the Law of the Lord, they returned to Galilee to their own town of Nazareth. And the child grew and became strong; he was filled with wisdom, and the grace of God was upon him. The “Temple in Jerusalem” is specially referenced in Qur’an 17:7, so either the Palestinians are lying or they believe the Qur’an is not perfect. While for non-Muslims, these options are not mutually exclusive, for Muslims faithful there can only be one answer to avoid cognitive dissonance: the Palestinians are lying for the “cause” thereby excusing their heresy. The man’s a second rate hack. He arrived in Jerusalem with his pre-conceived ideas and nothing on this earth is going to change them – Israeleveilcolonialnusurpers vs authenticindigenousexoticoppressedbrownpeople. Perhaps the FT could explain to me that when I walk along the Via Sacra in Rome, the carving on the triumphal arch to Titus shows the Roman Legions carrying back loot and booty (including a Menorah) from where? Proceeds from the sale of some of the loot and booty were used to build the Colosseum, perhaps the FT can explain how it is possible that both monuments were built long before Islam existed. So, obviously the Temple that was looted, and indeed razed, existed before Islam by many centuries.